The question is no longer if the Trail Blazers can win their NBA first-round playoff series with New Orleans. Now, it's whether the Blazers can get the series back to Portland. It's going to take some doing after the Pelicans swept to a 111-102 victory Tuesday night to seize a 2-0 lead in the best-of-seven series. Jrue Holiday, asked how he felt about his sterling two-way Game 2 performance, may have tipped off how the Pelicans are feeling going back to New Orleans for Games 3 and 4. "To get the win is the biggest part for both games (1 and 2)," said Holiday after scoring 33 points, dishing nine assists and doing yeoman work on Damian Lillard at the defensive end. "And (now we are) going back home, where we feel like our crowd is going to be our sixth man and definitely help us with these last two games." It might have been a Freudian slip. Holiday surely didn't mean to sound cocky, as if the Pelicans had a sweep in their sights and, perhaps, in the bag. It may also be #truth. The Blazers now have to win four of five games — including twice at Smoothie King Center — to advance to the next round. "This is a must-win," said Portland's CJ McCollum, and he wasn't referring to just Thursday night's Game 3. "We have to go out there and take both of them." The No. 3 seed Blazers can't help but not have their dobbers down after dropping a pair at home against the No. 6 seed Pelicans, who were underdogs in this series in the eyes of just about everyone but themselves. Out of 22 ESPN analysts, 22 picked Portland to rule the series. "It's great that we don't listen to the analysts then," New Orleans coach Alvin Gentry said with a smile. 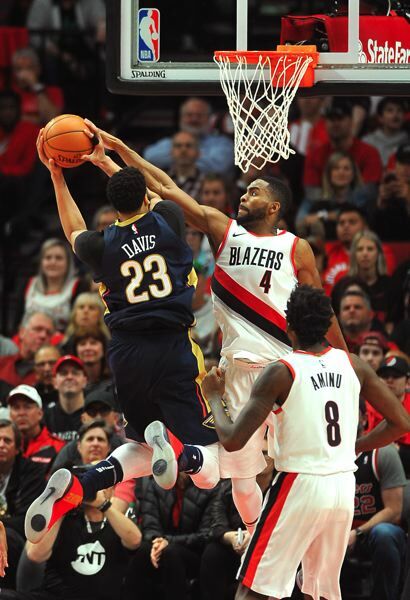 Anthony Davis had another big game with 22 points and 13 rebounds, but it was the work of Holiday and backcourt mate Rajon Rondo (16 points, 10 rebounds, nine assists) that did the Blazers in Tuesday. That and Lillard's ineffectiveness for the second straight game. The man who tied for fourth in the NBA in scoring (26.9 per game) and will likely be named first-team all-NBA scored 17 points on 7-for-18 shooting — 1 for 7 from 3-point range. He had only four assists and seven turnovers in 40 minutes, harassed by Holiday and his teammates. "I have so much respect for Lillard," Gentry said. "He's one of those guys who is going to try to will his way through anything. He's never going to give up. He's going to continue to attack and attack and attack." In the first two games, Lillard has averaged 17.5 points and 5.5 assists, shot .317 from the field and .313 from 3-point range. McCollum was better in Game 2, collecting 22 points and six assists, but still made only 9 of 21 shots from the field. "Jrue and Rondo are exceptional defensive guards," Portland coach Terry Stotts said of the containment of Lillard and McCollum. "(The Pelicans) have made a concerted effort to double-team and blltz our pick-and- rolls and get the ball out of their hands. It's nothing we haven't seen before, but they're doing a good job of it." Self-confidence has never been a problem for Lillard. But the first two games have been trying times. "I'm a little bit frustrated," the All-Star point guard said. "I expected more out of myself. Coming into the playoffs, you know teams are going to try to lock in and make the game hard for you. I give the credit to (the Pelicans) for executing their game plan, seeing two or three guys (defending him) and making my opportunities more difficult. "I just have to be better, it's as simple as that. I'm fine mentally. It's just frustrating to fight the entire season for homecourt (advantage) and then to not perform individually or as a team like we should." Holiday has been the best guard on the court in the first two games, averaging 27.0 points, 5.5 assists and 5.0 rebounds while shooting .545 from the field. No. 2 has been Rondo, with 11.0 points, 13.0 assists and 9.0 rebounds. "He's one of the best defenders out there on the perimeter," Lillard said of Holiday. "But in this series, he's just playing well. He's big and crafty. Coming off the pick-and-roll, he's able to get those floaters and get to the rim. He does that well. He's impacting the game on both ends of the floor." Both games have been up for grabs into the final minute. Both times, the Pelicans have made more plays than the Blazers in the clutch. "We responded well tonight," Gentry said. "Our guys have had a real calmness about them in this series so far. They haven't let anything bother them. We've executed when we really have needed to." "These first two games came down to a lot of 50-50 balls," Lillard said. "They were much more grimy than we were. They played a more physical game. They gutted it out more than we did. We've got to go down to their home floor and do the same thing they did here." The Pelicans — Holiday in particular — were very physical with Lillard. The referees called the game loosely, with only 29 total free throws. Lillard, who averaged almost nine free-throw attempts during the regular season, attempted only two Tuesday night. Holiday's method of defense, he said, was "just getting aggressive. It's a team effort. Everybody's being aggressive. (Lillard) is the head of the snake. He can get 30 or 40 (points) any time he wants to. For him, as well as CJ, we try to make it tough. It's the playoffs. We can be a little more physical. I try to always have a hand on (Lillard). Know where he is. When they get offensive rebounds, I try to stick to him." The Pelicans are one of the NBA's best road teams. They have now gone 29-14 away from Smoothie King Center. Since Jan. 28, they've won 22 of 30 games without their second-best player, DeMarcus Cousins, who is lost for the season after Achilles tendon surgery. They changed their style to a more up-tempo pace, moved Davis from power forward to center and played smaller, and made themselves a very tough out. Holiday, Davis said, "carried us tonight. He made some big shots in timely situations. He's doing it on both ends of the floor against some very tough guys, who can score almost at will. He is playing at a high level." Rondo said the Pelicans are an unusually close team. "I knew 'Dame' and CJ say they text every night," the 12-year veteran said. "But 'AD' and me and a few other guys were watching film together in the training room. Coming together on the road forms great team chemistry. That's what's allowed us to win these two games." Stotts has some personnel decisions to make before Game 3. Jusuf Nurkic came out more strongly than in Game 1 and had 11 points at halftime. But the 7-foot Bosnian suffered a leg contusion in the third quarter and, though Stotts said he was available after returning from the locker room, he never saw the court again. Evan Turner, starting at small forward for the injured Moe Harkless, had five assists and four rebounds but was scoreless on 0-for-6 shooting in 20 minutes. He also left in the third quarter with a toe contusion and did not return. Al-Farouq Aminu had a nice game with 14 points and 15 rebounds, and the Blazers got a lift with the return of Harkless, who had 11 points on 5-for-5 shooting and five rebounds in 27 minutes off the bench. "He was terrific," Stotts said. "We weren't going to play him as many minutes as we did, but he handled it well. I couldn't have asked for more from a guy who had been out for three weeks." There was no indication whether Nurkic or Turner would be available for Game 3. Stotts will likely start Harkless, anyway, and go more to rookie center Zach Collins, who had another promising performance with 12 points and five boards in 22 minutes off the bench. If you overlook Holiday's unintentional slight, the Pelicans aren't counting their chickens before they're in the knapsack. "We got two wins," Gentry said. "We still have to get two more. We're not overly excited about anything. We still have two more games we have to win. We're playing against a really well-coached, great team. We've done an exceptional job on those two guards, but you never know when they're going to go off. We're not celebrating anything. We haven't done anything yet." 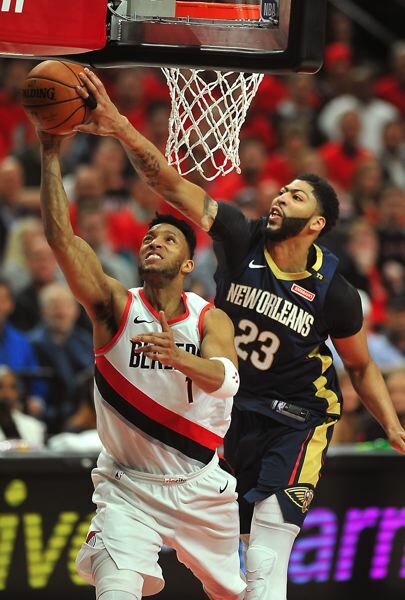 Portland and New Orleans split a pair of games at Smoothie King Center, the Pelicans winning 119-113 on Jan. 12, the Blazers pulling out a 107-103 victory on March 27. "We got a ton of confidence," Davis said. "We're satisfied we got both of these wins, but we know the series isnt over. They beat us on our home floor. We have to go home and take care of business. But winning two games on the road has given us even more confidence." Lillard's confidence surely has been shaken, but it wouldn't take much to get it back Thursday night. "My job is to do more," he said. "I know I can do more, because I always do. The right thing to do is to trust and make the right play, find the next guy. Finding that balance of being aggressive and making those right plays is what I need to do. "We dropped two at home. We feel we're capable of doing the same thing they did to us. I've got to be much better for us to do that. I know I'm built to bounce back that way. I'm frustrated, but I'm not down about it at all. I know going forward I can really turn it over." "We have to win two games in New Orleans," Stotts said. "Hopefully, it's the next two. It's easy math. I feel we're very capable of winning both games. The first two games have been very tight. New Orleans has made the plays to win in the end, but that's what makes a playoff series great." Lillard said the Blazers won't have to change a lot in the games in New Orleans. They'll simply have to play better. "We're going to get on the plane (Wednesday) and act how we always interact," he said. "There's something to be said for not panicking or worrying. "This is a position we didn't want to be in, but we're competitors. The challenge should be fun. We should accept the challenge. If not, it could be a quick series."